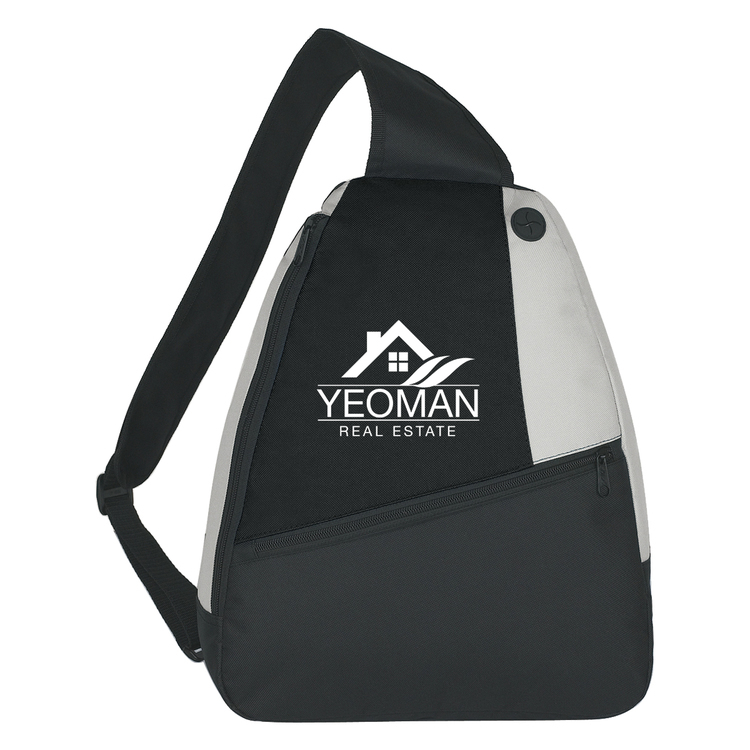 Add an element of style to your next promotional event with this large sling backpack featuring a large front pocket with velcro closure. The iPod port is great for city walking so you can listen to your tunes on the go! 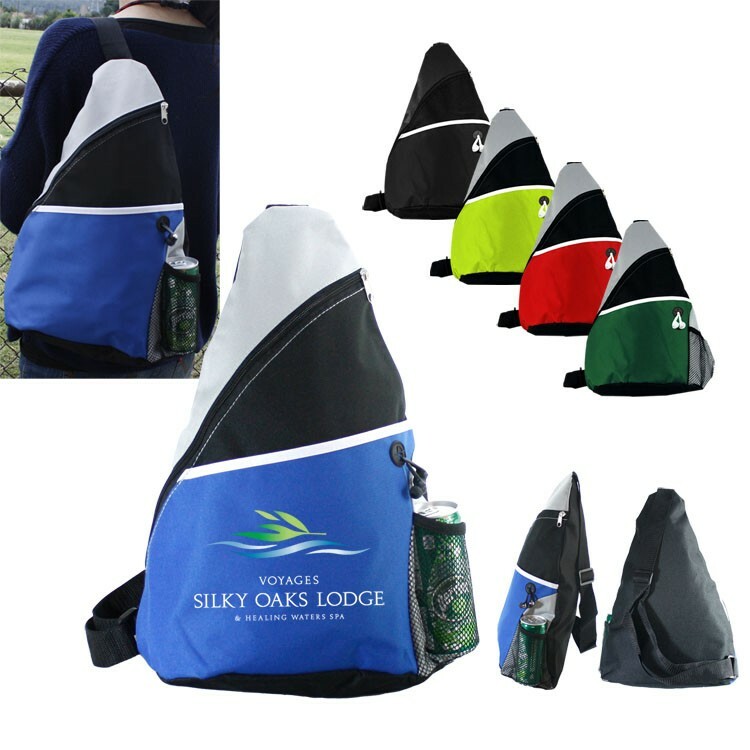 The side mesh pocket is great for a water bottle or drink of any kind while the large main zipper compartment is great for books, pens, pencils and anything you need to carry with you! The strap measures 40''. 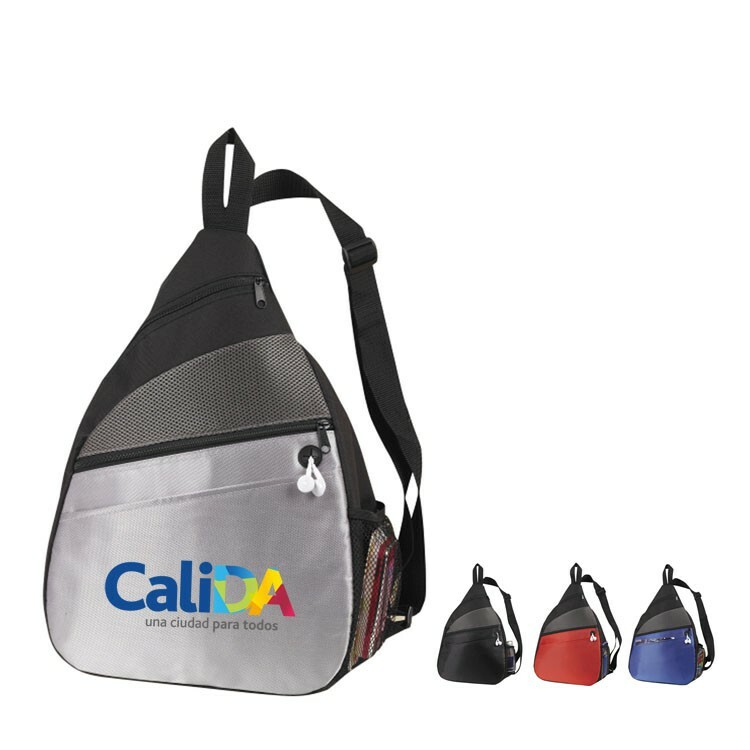 This sling backpack features an iPod port, adjustable shoulder strap for comfortable carrying, an open pocket for easy access to your keys or phone and a mesh pocket for a water bottle or drink. The adjustable strap has a length of 22''-40''. 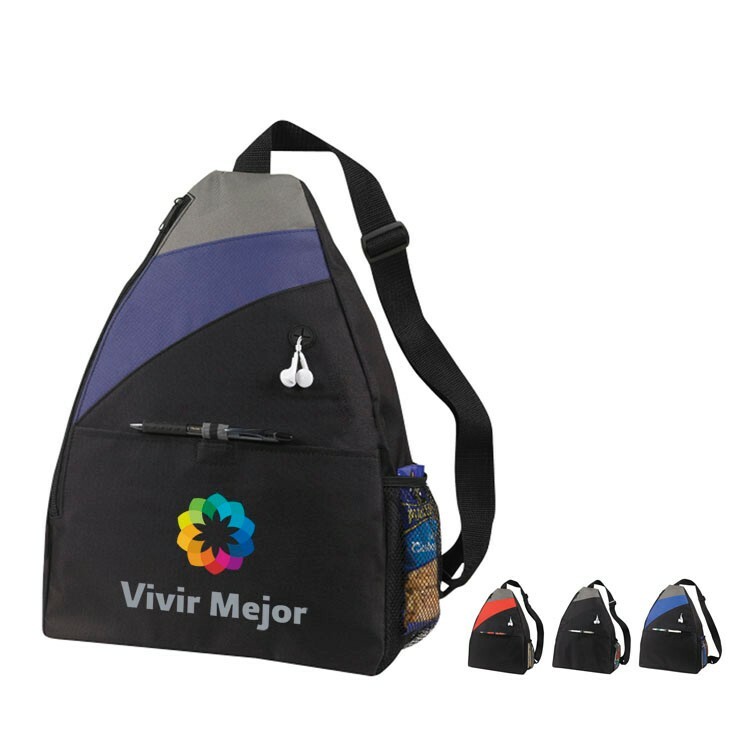 Made of 600 denier, this sturdy backpack is sure to impress your valued guests and clients when you customize it for your next marketing campaign or special event. 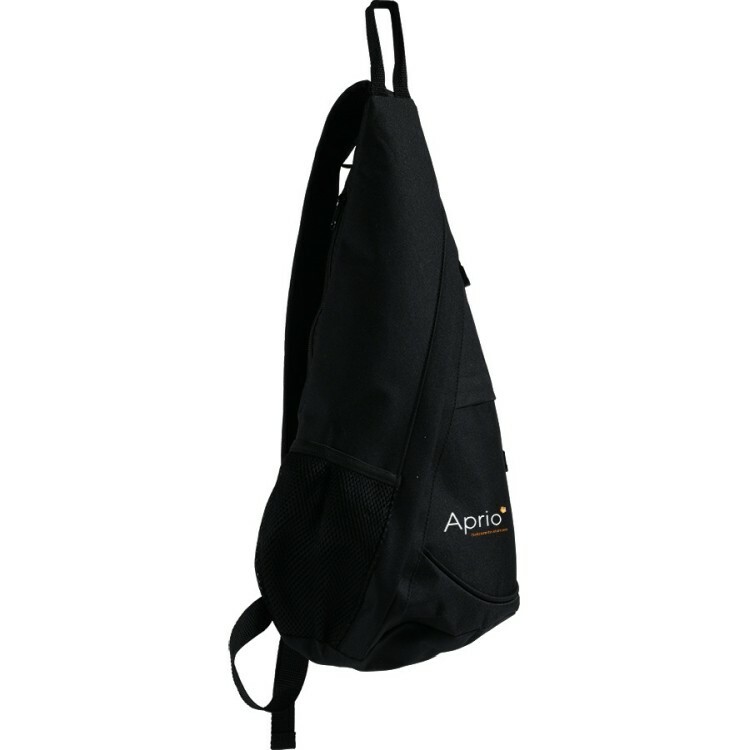 This Padded Sling Backpack features a padded zipper pocket that fits most tablets so you can take all your information with you safely. 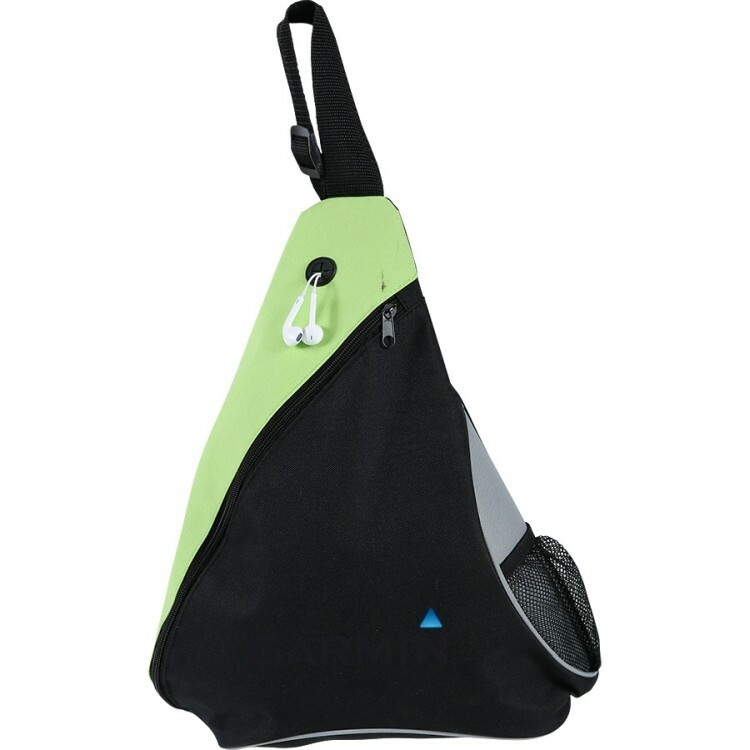 This bag has an open front pocket, iPod port and side mesh pocket for a water bottle so you can take your tunes and drink on the go! Constructed of durable 600 denier, metallic doby. 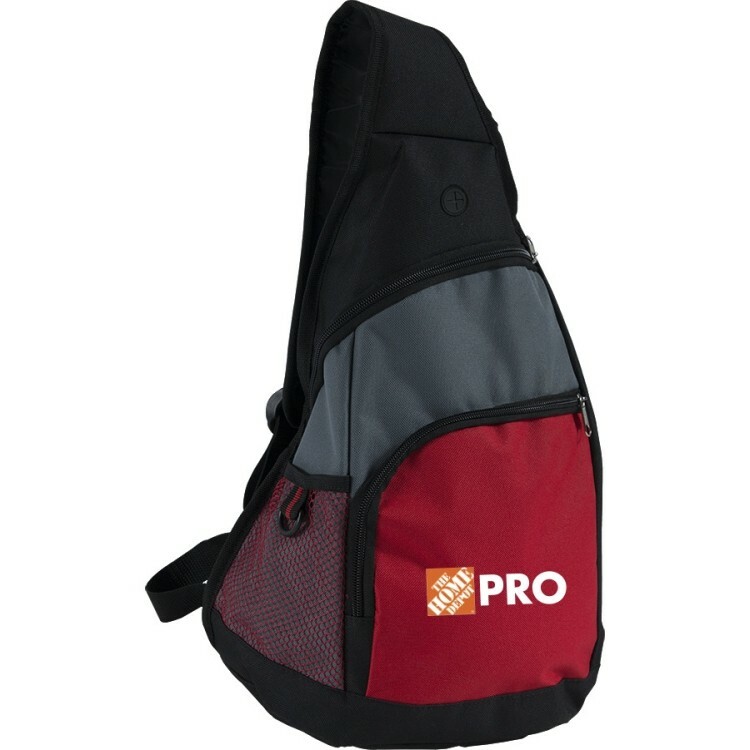 Featuring a shoulder strap measuring 40'', this backpack can be comfortably carried on long and sort trips alike! Don't be adverse to rocking this "murse"! 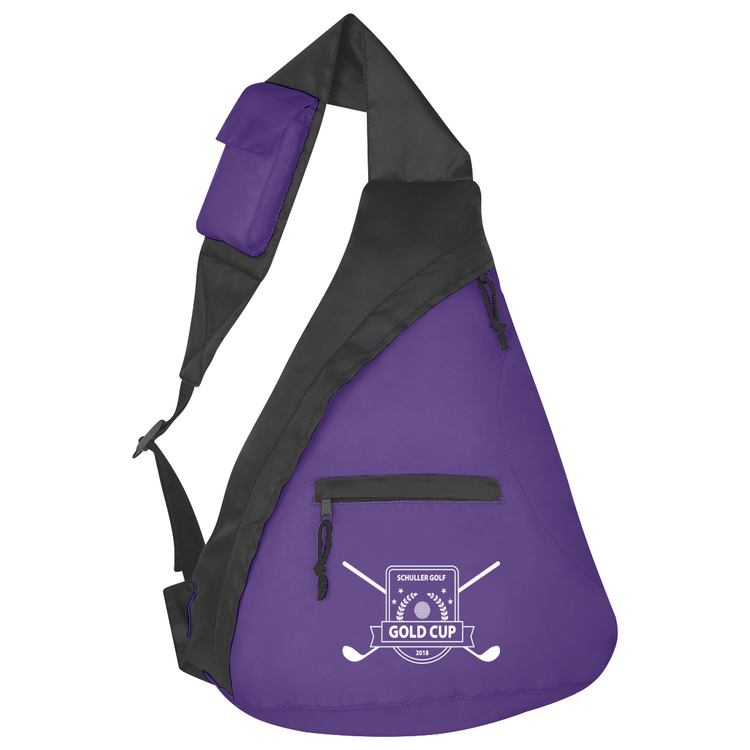 Wedge shaped sling pack with zipper closure and front open pocket. 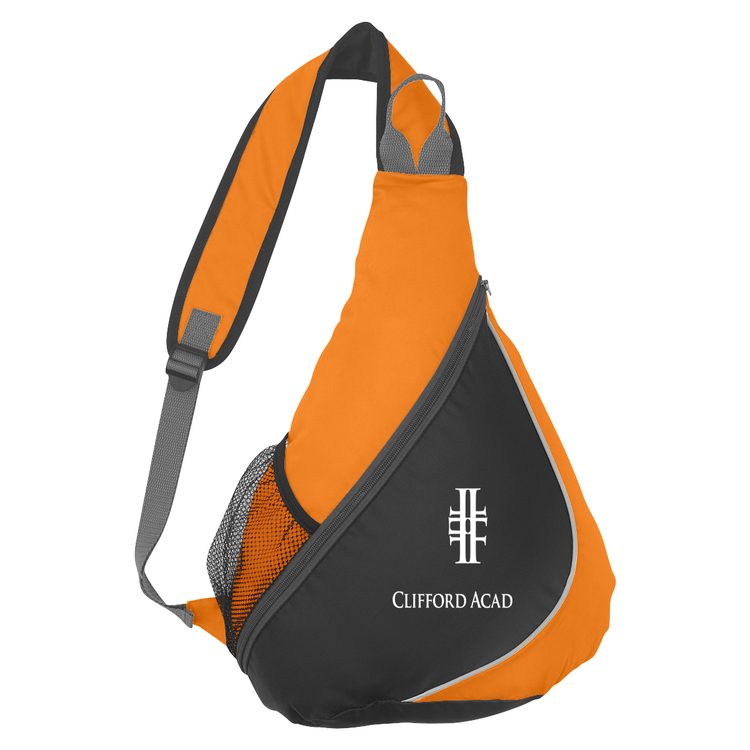 Single padded shoulder strap. 210D Poly This is wedged somewhere between backpack and fanny pack! When a backpack is overkill, and a you aren't brave enough to dust off the fanny pack, this gender-friendly pack is the ticket. So sling it and bring it...everywhere! 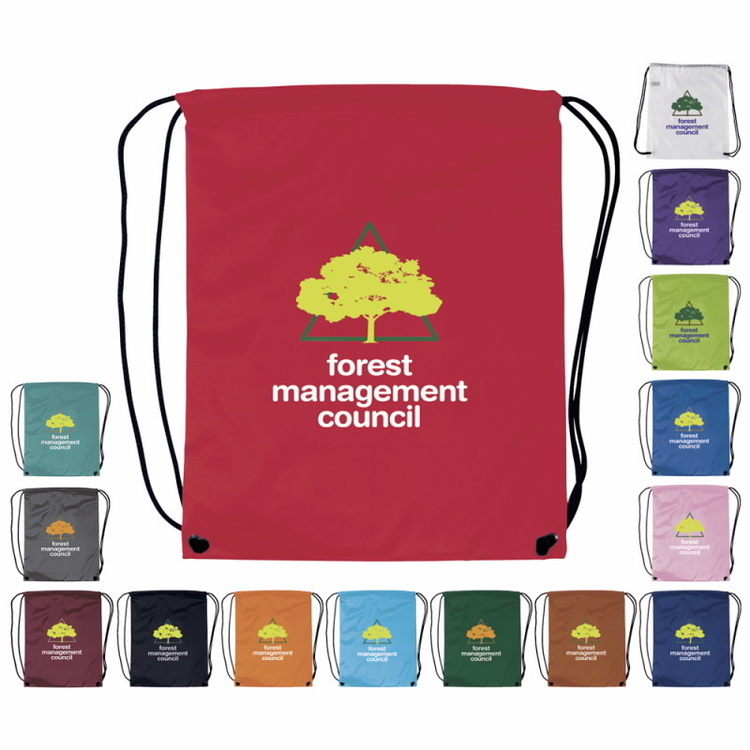 Front zippered pocket for easy decoration access. Stretch mesh phone pocket on shoulder strap. 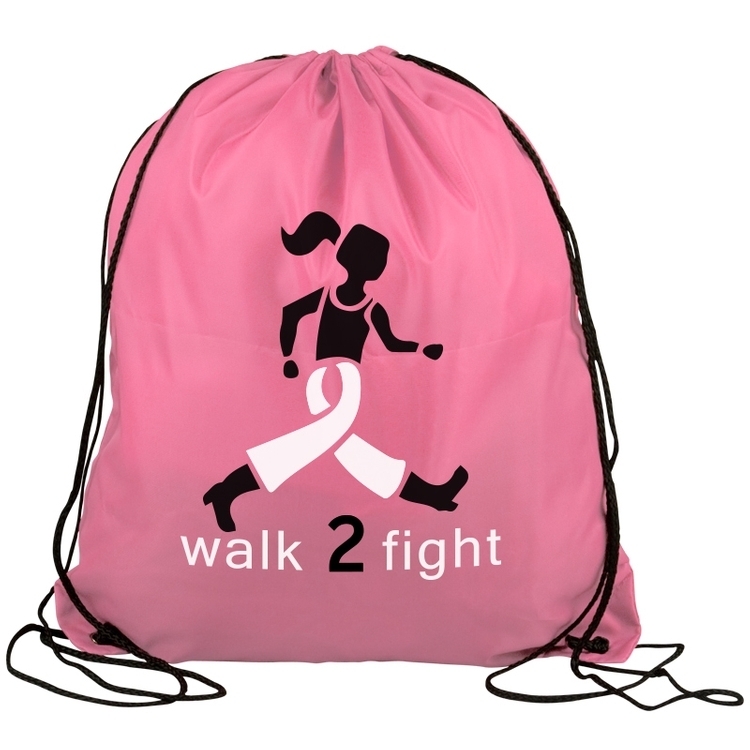 Dimensions: 18.75"h x 12.25"w x 4.5"d.
Capacity: 1,200 cu. in. /19.7 L.
Weight: 0.25 lbs. /0.71 kg. 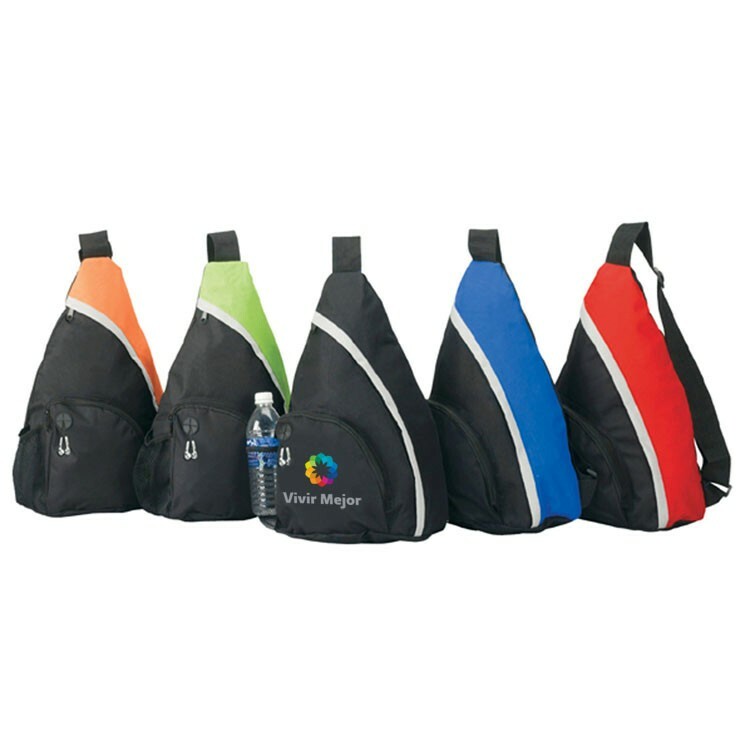 Frosted Spectrum sling backpack made of 600 denier polyester with PVC backing. 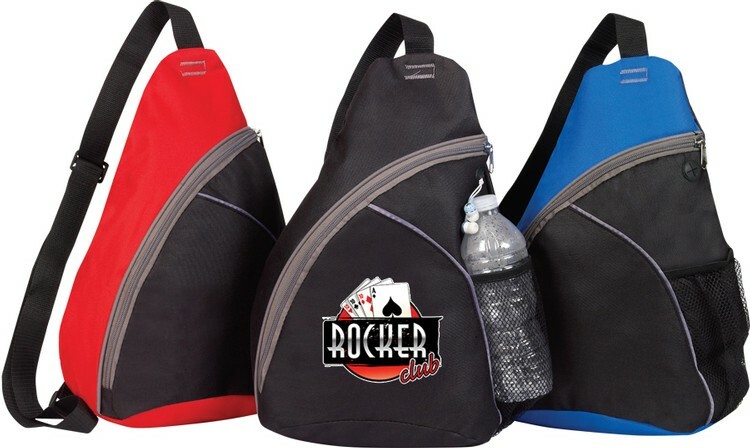 The perfect sling backpack to carry all your personal accessories on the go! Diagonal zipper compartment with inside sleeve fitted for iPad/tablet and built in ear port inside of back padded panel. Diagonal front open pocket and 3 exterior pen loops. Side elastic mesh pocket for bottle or accessories and cross body single webbing adjustable shoulder strap. Features abound when you're moving around! We didn’t hold back on this sling pack! Loaded with features that suit you when you are on the go. 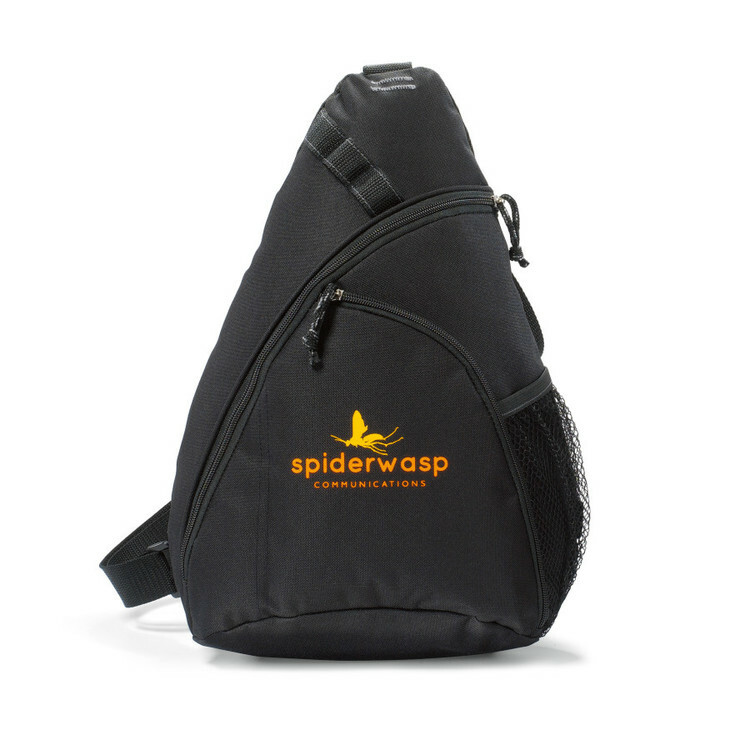 In the animal world, the Alpha is the leader; in the world of travel gear, this one leads the pack! 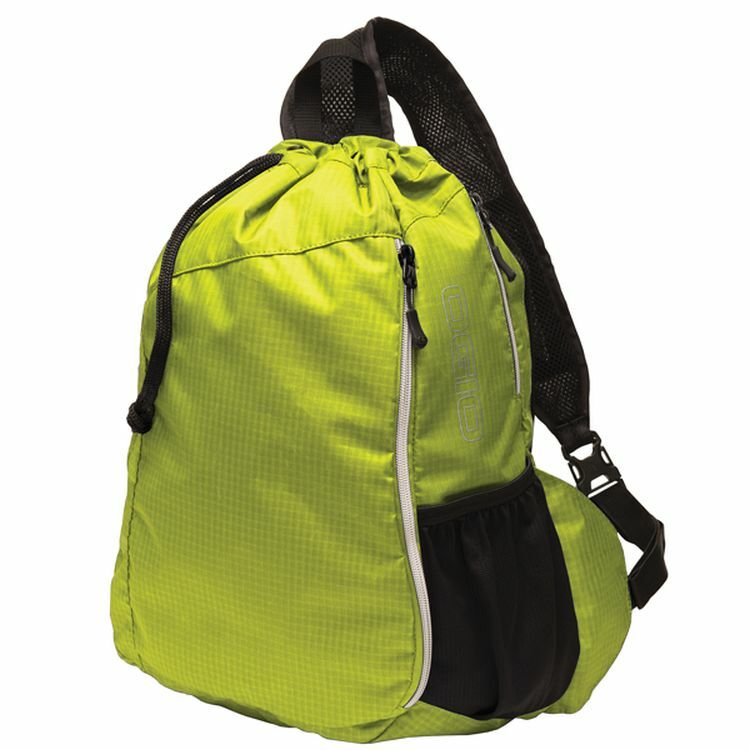 A generous main zippered compartment with additional front zippered pocket and a hidden, zippered safety pocket on back provides tons of room while chunky zipper pulls make it a zip to close. 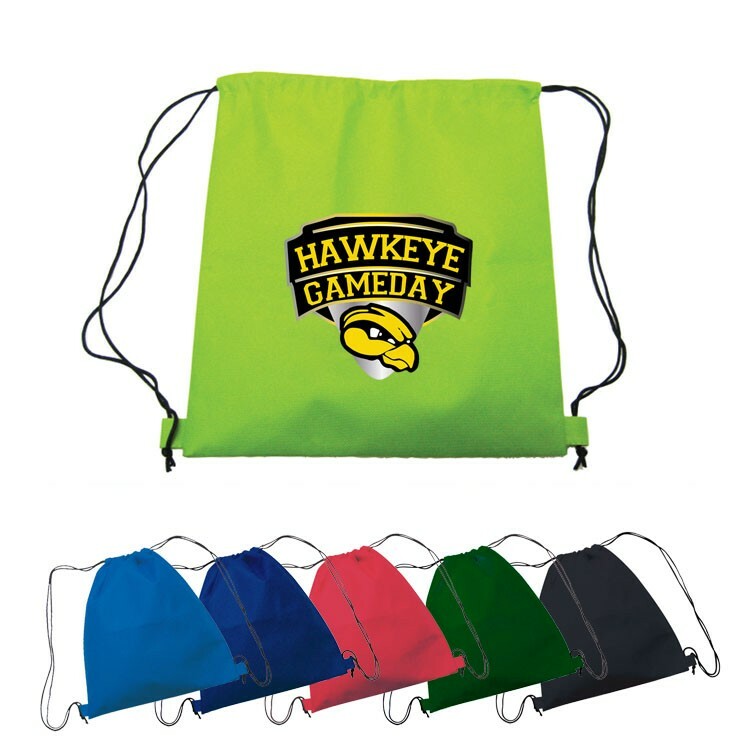 Additional features are a wide, adjustable, soft padded shoulder strap, side sponge-mesh pocket, plus a loop for hanging/storage. 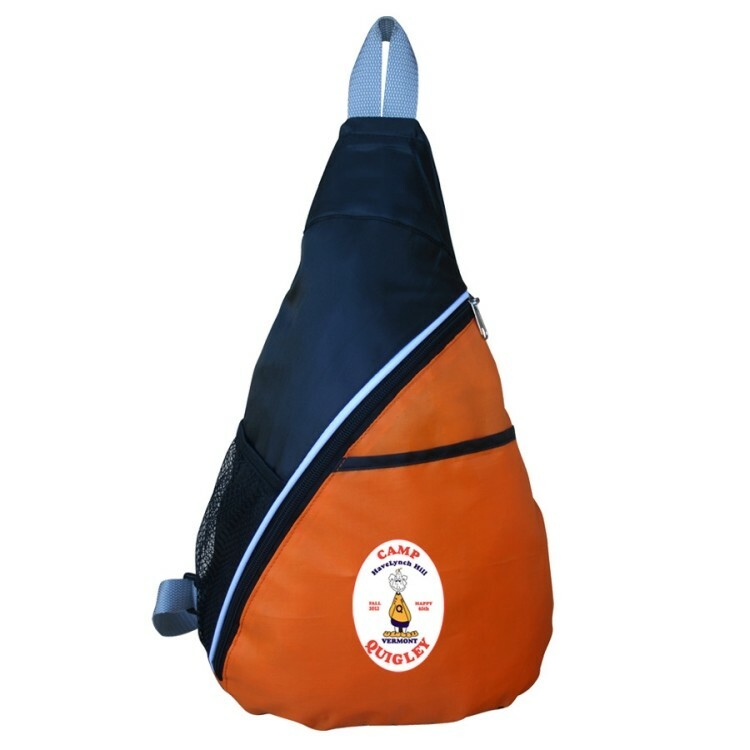 Exterior pocket is contoured with piping detail. 600D poly. 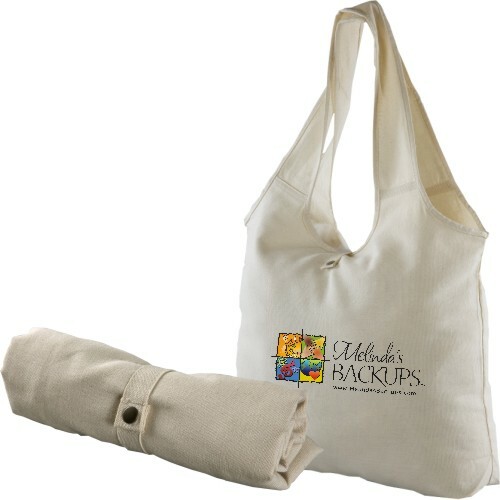 If your work attire is jeans and t-shirts, this will be your briefcase of choice! This sling pack/backpack hybrid blends the best features of both. 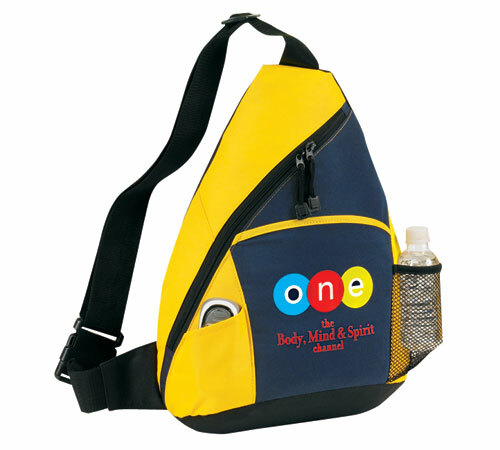 The rectangular shape gives it more room than the traditional sling pack while the single strap provides the convenience of the cross-body fit. 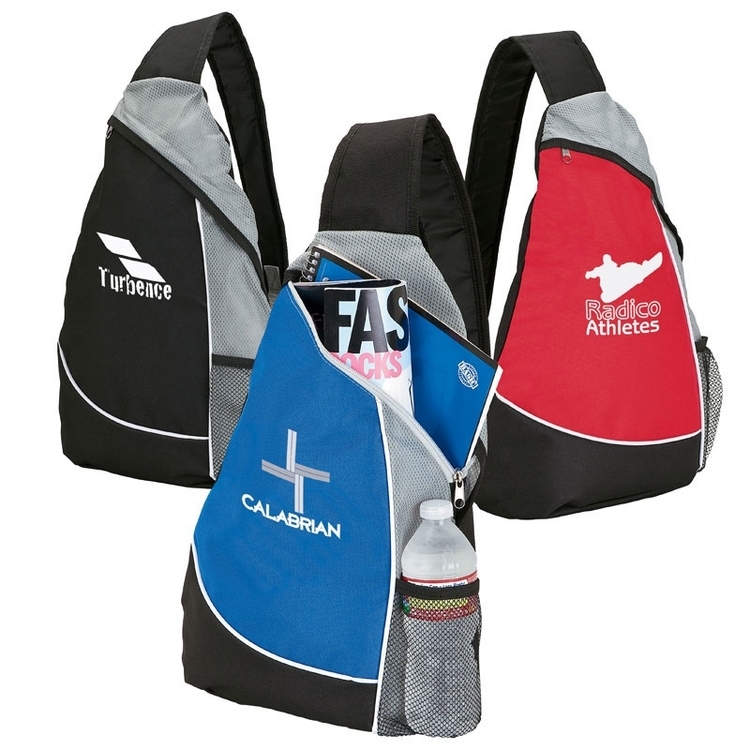 The wide, thick and adjustable padded strap ensures comfort. Side mesh pocket with D-ring to attach ID or keys for quick access. 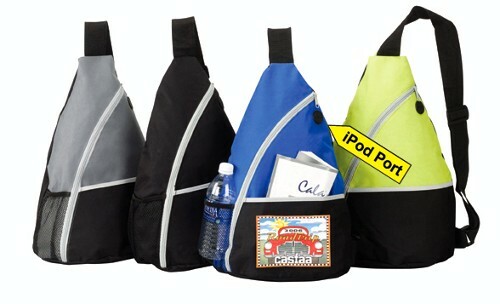 A zippered outside pocket and earbud porthole rounds out this fully featured pack! Durable 600D poly ensures years of use (and abuse). Stay in the groove when you are on the move! 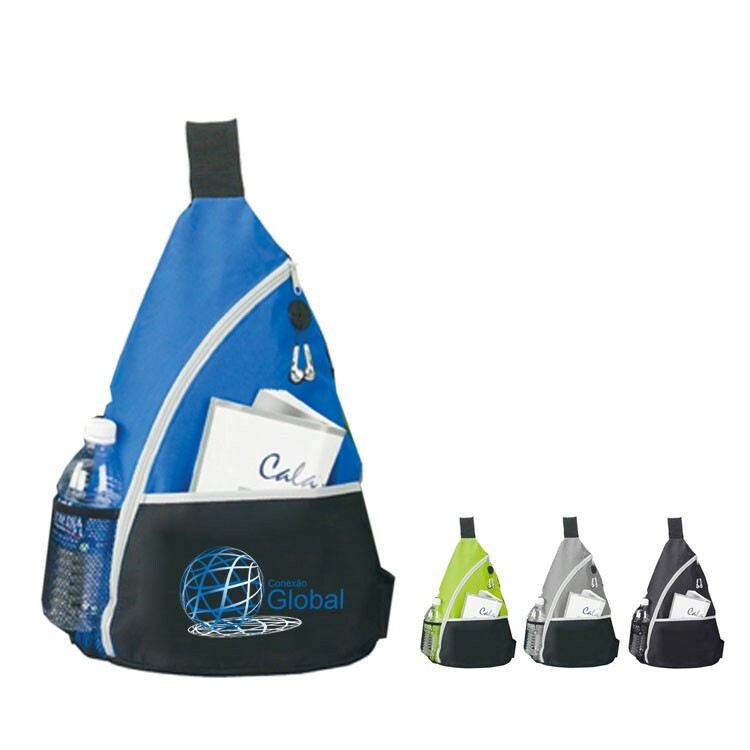 This stylish sling pack is perfect for carrying all your portable medial! Complete with media port for your earbuds, it is perfect for an everyday bag, purse/murse alternative or travel companion. 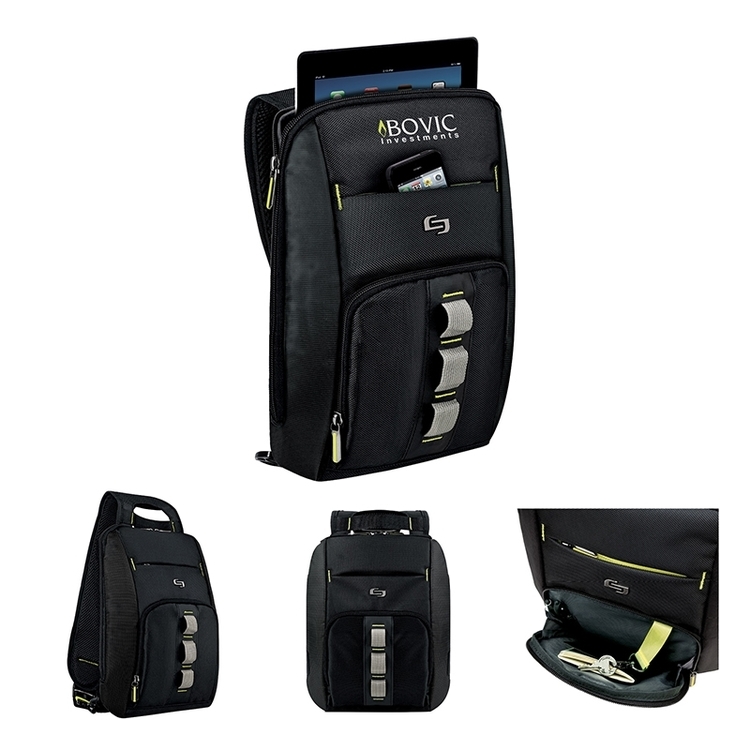 Phone, tablet, whatever your pleasure, this bag will hold your treasure. 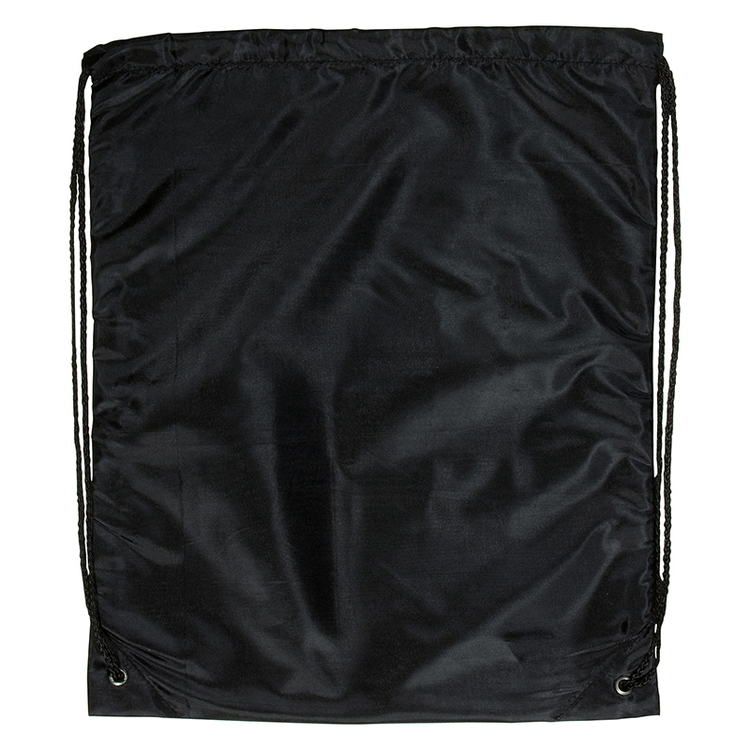 Large main zippered compartment with mesh side pocket. 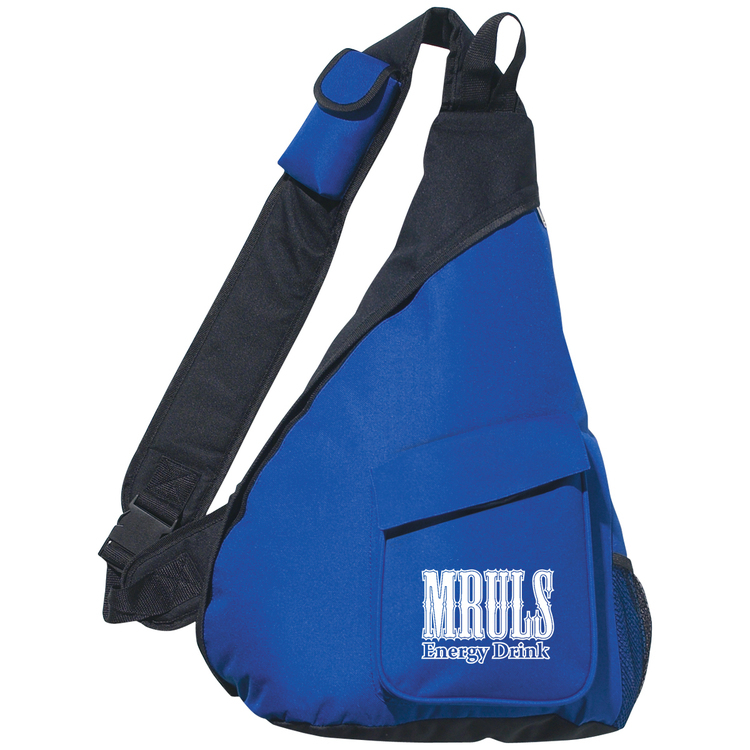 2” wide, adjustable shoulder strap ensures comfort even when fully loaded. 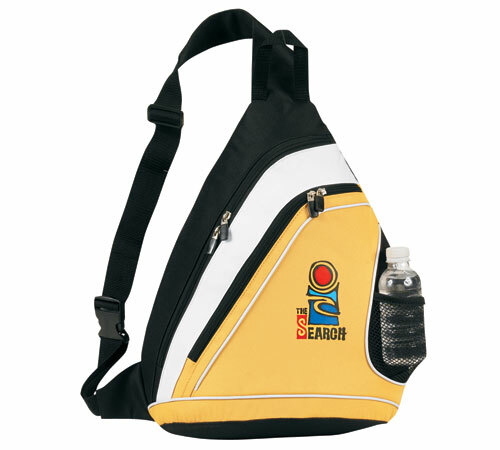 Contrasting color side panel and piping details adds to the sporty look of this bag. 600D poly. 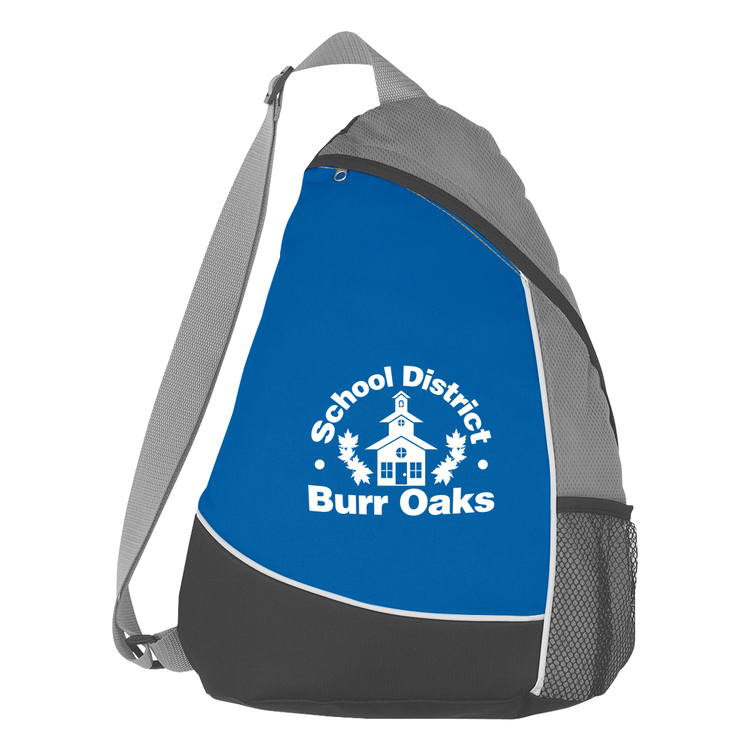 Side Zippered Main Compartment With Padded Back. 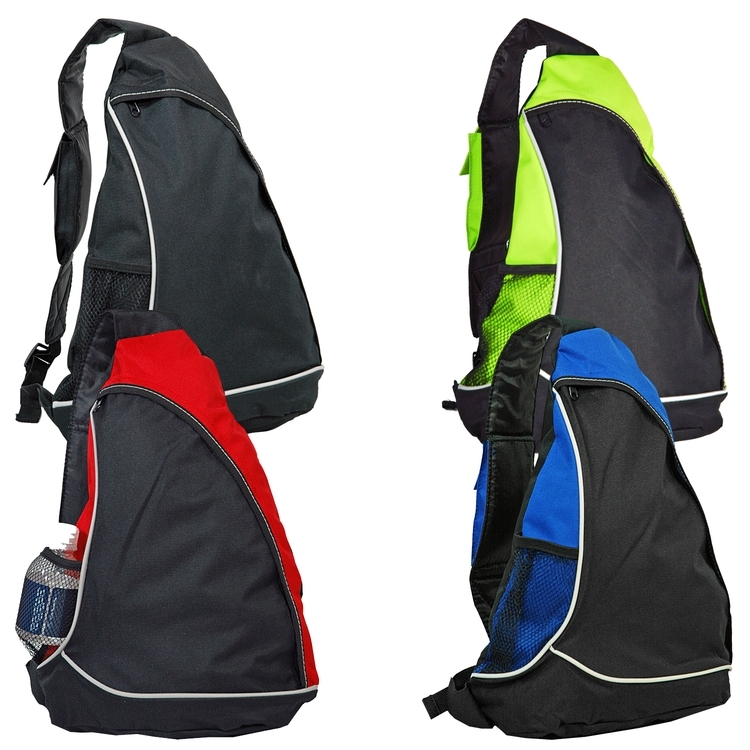 Material: 600 D polyester & 300 D Ripstop with PVC backing Description: * Diagonal large zippered opening to main compartment. * One front open pocket. * Two opened side pockets and one elastic mesh pocket. 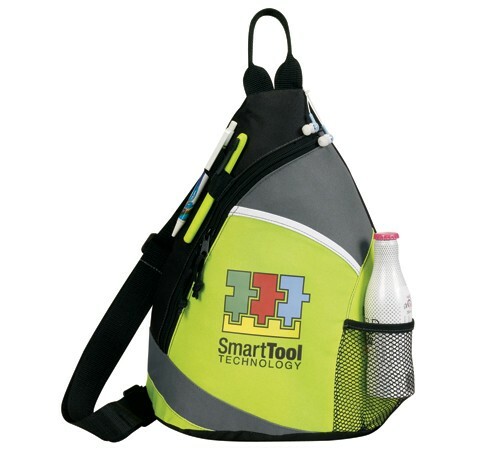 * Comfortable poly web adjustable shoulder strap with fastener buckle.